The speaker politely and correctly asserted that those long-held foundations of the USDA’s hay grading system simply did not do an adequate job in predicting animal performance. Of course, the same can be said for acid detergent fiber (ADF), neutral detergent fiber (NDF), and relative feed value (RFV), other cornerstones of the grading system. To be clear, the TDN value being referred to is the one derived from ADF, sometimes called the Western or California formula. In a similar context, forage NDF content largely drives RFV. Total fiber content is an important consideration, but how much of that fiber gets digested (or doesn’t get digested) is equally if not more essential to know, especially if being fed to dairy or beef animals that are lactating or growing. Highly digestible forages can boost dry matter intake and cut feed costs in the form of additional supplements. Though it’s true that protein is an important component of an animal’s diet, it rarely is the most limiting factor; energy, on the other hand, often does limit performance. In a forage-based diet, that translates to fiber digestibility and rate of digestion. 1. High-fiber digestibility often doesn’t cost anything; it’s mostly a function of making timely harvest and grazing decisions. 2. Harvesting forage with relatively high-fiber digestibility is almost always a net economic winner whether you feed it or sell it. 3. Though yield and stand persistence are always important considerations, keep in mind that at some point in the plant maturity process the forage yield may continue to climb, but the harvested amount of digestible nutrients declines. It makes little sense to capture yield of additional fiber that won’t be digested. 4. It is very possible to have high-protein forage that is low in fiber digestibility. Wilting hay that is rained on will often fall into this category. Don’t be fooled into thinking that because the forage has a high protein content that it is also high in fiber digestibility. 5. Money spent on forage varieties that have research-proven high-fiber (NDF) digestibility is generally money well-invested. 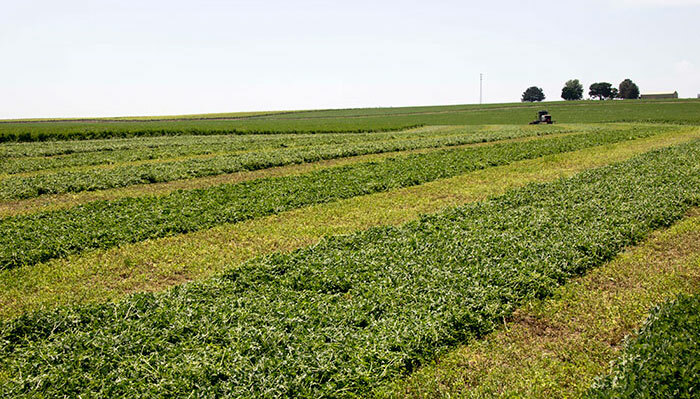 Reduced-lignin alfalfa varieties, with corresponding high-fiber digestibility, fall into this category. This is true if for no other reason than providing additional insurance against rain delays, which have already come into play in a big way during 2017. 6. As with varieties, selecting forage species with high-fiber digestibility will also pay dividends. Meadow fescue, for example, has been shown to be superior to many of its perennial cool-season grass counterparts. Ryegrasses also excel in this regard. 7. Grasses generally contain both more fiber and also a higher percent of digestible fiber than legumes. To capture the “grass advantage,” stands must be cut early as fiber digestibility declines rapidly once seedheads appear. Highly digestible grass forage is often capitalized on through good grazing management but seems less often captured when grass is cut for hay or haylage. 8. Just because the hay market doesn’t value fiber digestibility doesn’t mean that you can’t. Put your money and faith in metrics such as NDF digestibility (NDFD), undigested NDF (uNDF240), total tract NDF digestibility (TTNDFD), relative forage quality (RFQ), or a summative TDN calculation. You may be able to find buys that are currently undervalued in the market. 9. Growing environment affects fiber digestibility. Cooler environments (high elevations or spring growth) will produce forage with higher fiber digestibility than hot environments (desert or summer growth) if all other factors are equal. 10. Though not all livestock classes demand forages with high-fiber digestibility, always striving for such forage still makes good sense. Rare is the year when too much high-quality forage is a problem.